WE ARE BUILDING A COMMUNITY OF PASSIONATE, ACTION-ORIENTED PEOPLE TO HARNESS THE POWER OF OYSTERS TO MAKE A DIFFERENCE IN THE HEALTH OF THE CHESAPEAKE BAY. Decades of excess runoff of silt and sediment, historical overfishing and disease severely impacted our native oyster reefs. Oysters are a keystone species because they filter nitrogen and phosphorus from the water, and serve as critical habitat for the Bay’s underwater community. Properly functioning and resilient ecosystems reduce risks to our health, benefit our local economy and preserve our natural resources, not only today, but for generations to come. Over the past two decades, ORP has planted approximately seven billion oysters on 2,400 underwater acres, the equivalent of 1,800 football fields! Your support has never been more important to help us continue this critical work. 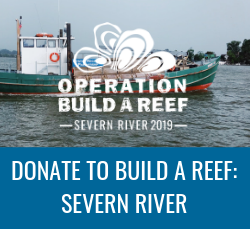 A $50 tax-deductible gift will enable ORP to plant 5,000 water-filtering oysters. Every oyster planted helps the survival of the species. Thank you for supporting us in our quest to restore the local oyster population and make an impact on the future of the Chesapeake Bay! *Over 95 percent of all donations go directly into our restoration programs. Contributions to ORP are tax-deductible to the extent permitted by law. Oyster Recovery Partnership is a full 501(c)(3) non profit organization. ORP is a member of EarthShare Mid-Atlantic, a federated workplace giving program through the Combined Federal Campaign to give federal employees the chance to support a healthy environment one paycheck at a time. Federal workers can designate gifts to the Oyster Recovery Partnership using code 91587.